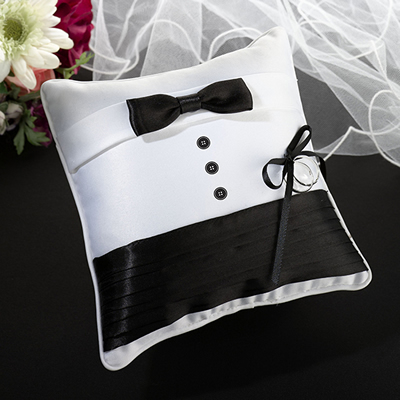 The ring bearer walks down the aisle just before the flower girl and carries a ring pillow with two rings tied to it. As you can imagine, typically these are not the ACTUAL wedding bands, rather a representation of them. It can be risky to entrust the real rings to a young child, so the ring bearer role is largely symbolic (but definitely cute). Generally, the best man and the maid of honor hold on to the real rings. 1. Who to choose: Ring Bearers are usually between the ages of 3 to 7 years old. 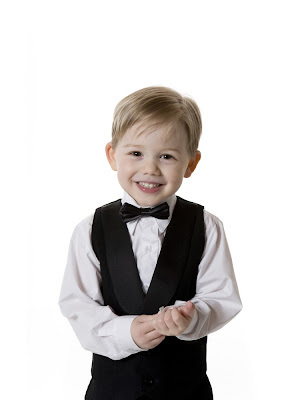 Kids 8 and older are typically given another role, such as a "junior groomsman". Generally there is one ring bearer but if you have more than one little boy who you can't resist including in your wedding, you can give them different roles. For example, one may have the task of ringing a bell and announcing "Here Comes the Bride! ", just before you walk down the aisle, or one can be the page (who manages the long train for the bride). 2. Dressing the ring bearer: The ring bearer's outfit typically matches or complements the groom's attire and the theme of the wedding. Be sure to take into consideration how comfortable (or uncomfortable) the formal outfits are for the kids to wear. Make sure you don't dress him too soon on your wedding day. He will tire of the outfit quickly, so it's generally best to dress the ring bearer close to the time of ceremony. 3. Make him a part of the wedding party: Include your ring bearer in the rehearsal as well as any other pre-wedding events that are appropriate. This gives the ring bearer time to get to know the others in your wedding party (so he's not nervous or intimidated on the day of the event) and allows him to be more comfortable being part of this group. 4. Keep him occupied: As soon as his job in the wedding ceremony is done he may become bored or restless during the remainder. Make sure his parents are seated on an aisle so they can assist, if needed. After the ceremony, have a few items available to keep his attention while he waits for pictures. Stay away from candy or sweet treats before the ceremony, though. 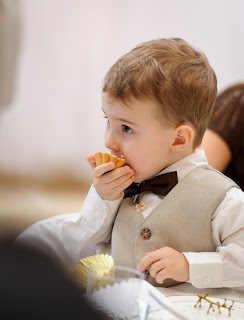 You don't want to give your ring bearer a sugar rush for the ceremony or for the photo session afterward. Small healthy treats are okay, but make sure they are easy to eat and not messy so you can keep his outfit clean through picture time! 4. 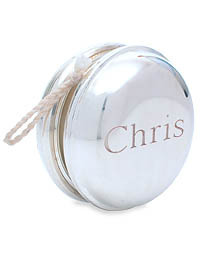 Be sure to give him a small thank you gift: The ring bearer's job is hard when you think of what he has to do, especially for his age. A fun thank you gift may be one of those items you give ahead of time. Depending on what type of gift you select, it can help keep them busy during the remainder of the wedding ceremony and well in to the reception. Remember, with children anything can happen, so don't be frustrated if all doesn't go exactly as planned. After being part of the wedding ceremony and the photo session your ring bearer will be looking forward to the reception. He'll be able to eat and play with his toys or gifts to his heart's content!